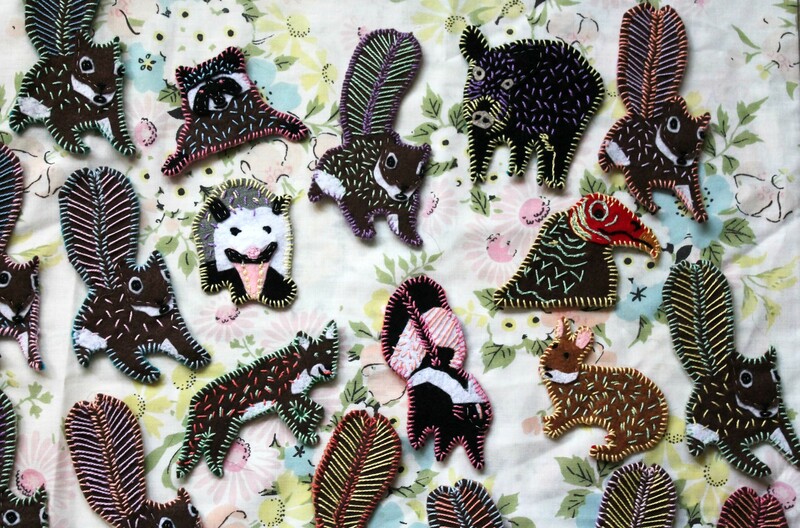 ASHLEY BELANGER is a writer, and the creator of a hand-stitched Florida zine, Felt. I met Ashley years ago, but I have primarily appreciated her work from afar. I’m honored to conduct this interview on behalf of her project Felt, which I have respected since its creation. I admire her authenticity, skill, and the heart that goes into her work. The following conversation discusses Ashley’s process for both creating the project while simultaneously exploring personal elements within her life. Delila Smalley: I remember seeing a post online years ago which was very humble regarding your project. When I first saw you doing this, it was the first of its kind that I had seen, and I remember being totally in awe at the tactile nature and dedication of your work. How did your journey with Felt begin? Ashley Belanger: Felt pulled me out of an impatient spiral. I’d spent my entire adult life in the same state. I was desperate to have experiences outside of Florida, but I was mostly too broke to afford travel (or even sometimes my phone bill). I was overly critical of myself for wasting so much time feeling like I lived on a loop. To quiet the anxiety, I forced myself to go outside. DS: That element of youth and also anxiety is all too familiar. How did your decision to get out of the house affect your perception? AB: That put me on my patio more and more. I’d do what amounted to weird little Florida meditations, watching lizards stalk butterflies on my screen door or noticing the shifting coloration of the Spanish moss. I thought, as long as I’m going to stay in Florida – which I was, so that’s that – why not try and find more things that I like about here? And in turn, why not pay attention to what I like about me while I’m here? What began way too far inside my head turned into a mass of memorable weekends exploring Florida parks. 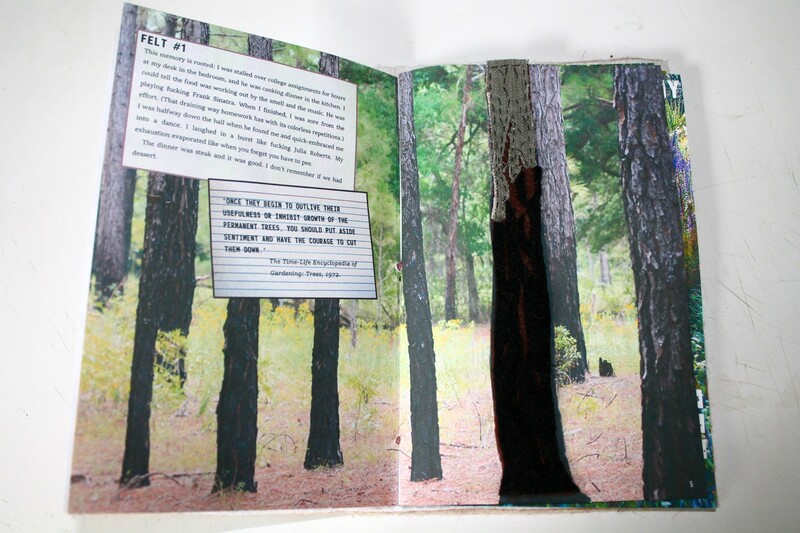 Felt is a literary zine that serves as my tribute to this experience. DS: It’s interesting cultivating the exterior to kindle the interior. Can you explain how the personal aspect connected you to the landscape? AB: It’s personal on purpose, and I wanted it to feel like it was made from my hands. I took photographs on day trips to force a conversation between the landscapes I stood on and the thoughts they inspired. DS: I admire how you created these individually stitched pieces, when it would have been so much easier to merely hit print. It required vision and dedication to execute these with precision. How did the images you took while walking transform and make their way into Felt? AB: Sometimes I would just print the picture, like I did with the Ugly Epiphany series, but other scenes would be lovingly recreated, including hand-stitched lily pads in Orlando Wetlands Park, an embroidered tree from Lake Louisa State Park, or a hand-dyed felted sunset at Hobe Sound Beach. At the same time I was visiting park, I had also been collecting vintage science textbooks and copying passages where the phrasing really resonated with me onto notecards that I filed away. In another drawer, I stashed notecards where I dashed off quick, emotional thoughts, the kind that often sprung during my walks. I used these excerpts and raw thoughts as writing prompts to more deeply explore what it was about the way the science books were worded that was hitting me so hard. I wanted to understand why these words stuck with me. 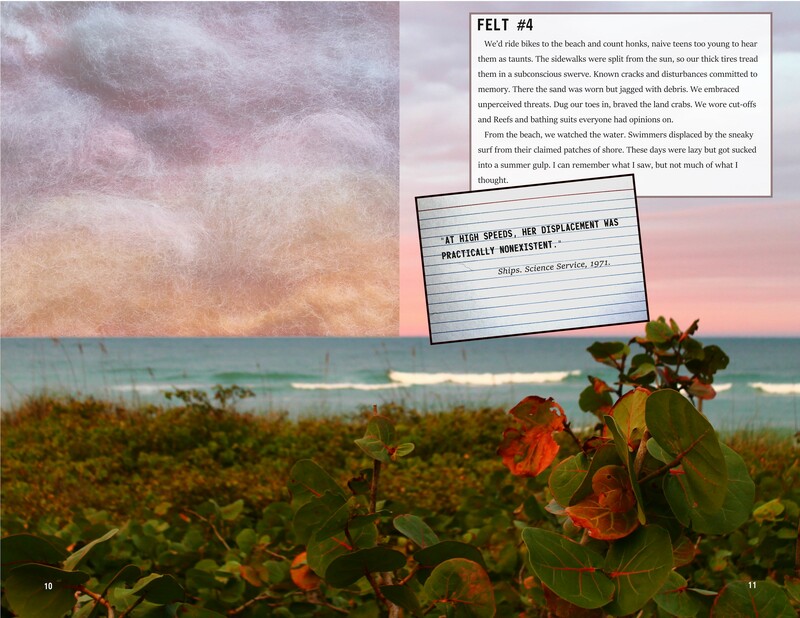 What I found were memories from my youth in Florida, so I paired thought and science notecards to revive my fading Florida memories and set them against Florida scenes in the zine to try and revisit that feeling on the page. DS: I love the integration of scientific and emotional information within a systemic approach, which was another aspect that really drew me to your project. As you continued, was there a point when you wanted to include anything beyond the environment? AB: After a while, I started feeling glaringly alone in the zine when in reality there is no denying that Florida is hugely and prominently also about the people who live here. 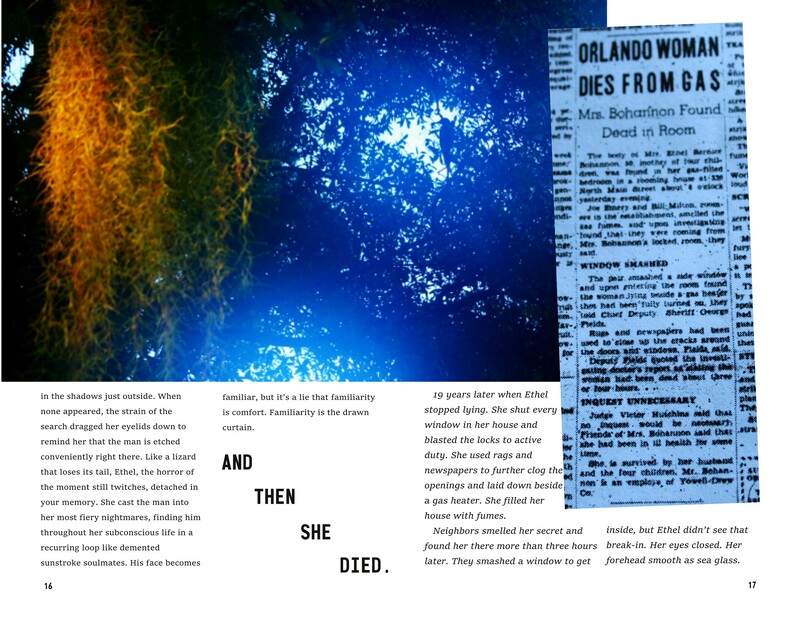 I wanted to include other voices from the past, so I spent time scanning historical microfiche archives of the Orlando Sentinel and clipped out obituaries from a century ago that affected me in their sympathetic circumstances. The first was a man who died in a fireworks factory explosion, and the second was a woman who suffocated in her sweltering apartment. I used fiction to step into their shoes. 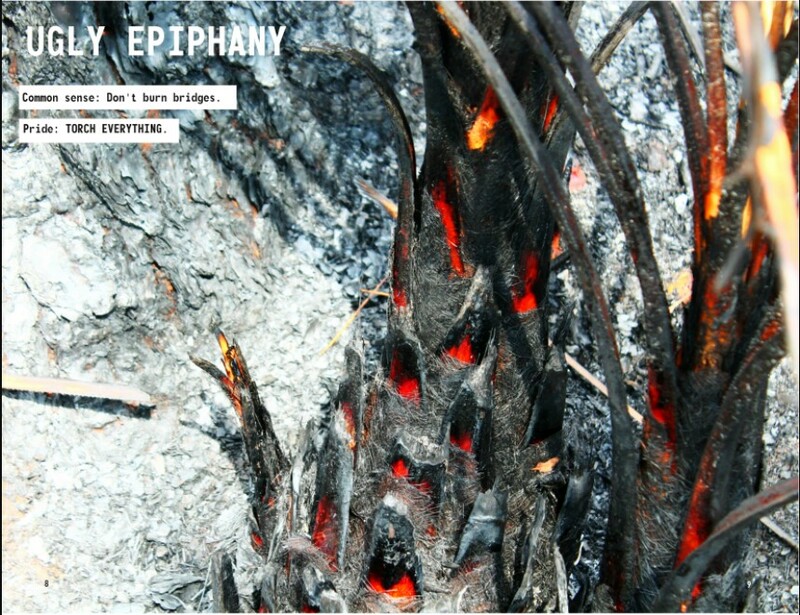 DS: This juxtaposition of two realities, both with the Floridian environment and the Floridians themselves, is an interesting approach–particularly with its respect to death. You seem to intertwine death unflinchingly, and something within your approach echoes the Southern Gothic to me. Did your engagement with the idea of Florida people transform as you continued? AB: I am definitely attracted to Southern Gothic literature and I went to school in Florida, so those writers represented much of what I read and admired in writing in my youth. So the influence is definitely there, but it’s also kind of true that death is an unavoidable topic in Florida. The oppressive heat shrivels plants and kills living creatures around you every day. Death is a visual here. I suspect that it affects everything, and it shapes people. As a journalist, I went back in time to respect Florida’s history in my zine, but I also wanted to include voices in Florida from the current time period. For that, I turned to Facebook as its own form of a Florida landscape to explore. 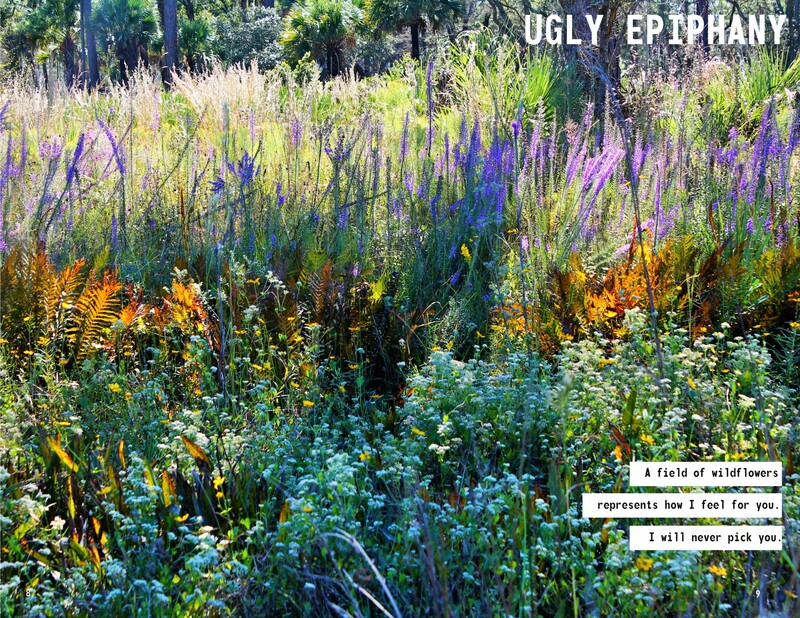 I sampled Florida voices from my feed and chopped them up to create crude messages, then stuck them in the swamp out in Devil’s Millhopper and Silver Springs National Park. I was hoping this would reflect my experience with socializing, which is that people always find you where you are–physically and mentally. Unless you’re a lizard, then they probably find you trapped between the window and the screen. DS: Did you leave anything that connected the messages to you, so they could reach out? Or did you just leave the printed excerpts to be discovered? AB: With the Facebook excerpts, my intent was to contrast the impact that gazing at my Facebook feed had on me with the impact I experienced from wandering in the woods. So I definitely think I’m still in there, because the resulting pieces reflect my personal reaction and attraction to these Floridians. My process for selection was to read each status and ignore the intended message, but instead to look for imagery. Once I had pulled a bunch of Facebook status imagery into a word-document, I would group them by themes. From there, I tried to create a flow that represented the conclusion of my reaction to these images, so that as you were scrolling through these Florida voices and getting an idea of the way different people use words to paint the world, you could see how you react, the same way you might test your reaction when scanning a landscape or a crowded street. The exercise was supposed to help me understand what stood out to me on Facebook so I could ask myself whether that was having an unconscious impact on my experience with Floridians in the real world. I still kind of think it would be neat to see how other people’s imagery would change if they did the same experiment by scanning their own Facebook feeds. DS: Another thing that fascinated me about your process is the length you went to not only stitch the covers, but also to print by hand. For the people who are just learning about your work, what was your printing process? AB: My plan to print the zines was really informal. I own a photo printer, I’d print them myself. When it turned out that the zine was well-received, I was ill-prepared because I was not expecting the reaction that Orlando gave it. The zines also found their way out of state to cities like: New York, Seattle, Los Angeles, Austin, Asheville, Portland, Boston, and Miami. I was only a little jealous that the zines traveled out of the state when I couldn’t. DS: That’s an incredible reach considering you did this on your own. How did you respond to the demand and did it alter your plans for creation? AB: I had to limit the print issues to 100 to try and limit expenses. I sprang for the nice, thick copy paper and used a linen textured decorative paper to go with the hand-stitched cover. It all jammed the printer regularly. I spent hours flipping sheets of paper and feeding it gently into the Canon’s fickle jaws. The CL-41 ink cartridges stained my hands, and it felt like it was always running low. I bought a long-reach stapler and it is now my third favorite possession. It would’ve been cheaper to have them printed, but it was incredibly addicting putting the zines together, and I was neurotic about needing a full bleed. DS: Now that you’re in a different state, does your experience with Felt feel finished? AB: I left Florida last July and moved to a different extreme in Chicago. Florida comes to mind often, and it’s these distinct and remote Felt locations where I found not just more to explore, but more to know. When do alligators feed, or thunderstorms start, or what does it mean when the trail starts to sink. These scenes are deceptively enthralling, like a conspiracy theory. There’s always more to consider the longer you look. DS: Did this experience expand into anything else? AB: I decided I needed to do more, so I added a felt zine jacket I made on my machine and extra inserts like Florida postcards and patches. I think that’s what ends up being empowering about these projects. I don’t have to compromise on anything I really want to do. And if there’s one thing I learned living in Florida, sometimes you have to be uncompromising.